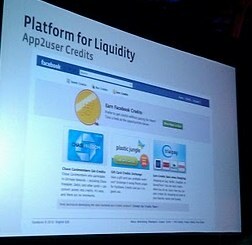 Today at f8, Facebook’s Deb Liu walked developers through the future of Facebook’s official currency, Facebook Credits. During this presentation, Liu discussed some of the new features Facebook plans to launch in the near future. 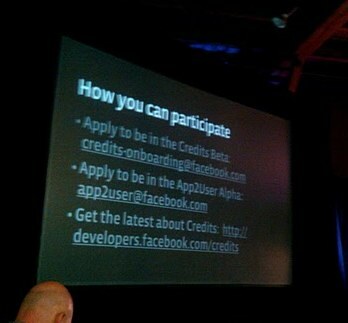 One new feature is called App2user Credits. This is a set of promotions that allow users to earn Facebook Credits in ways that don’t involve paying with their credit card. Liu presented three examples. First, Liu said that users could earn credits through credit card reward programs (she said Chase was already involved in setting up a program). A second example involved Plastic Jungle, the service that lets you sell gift cards you don’t want. And users can earn credits as they shop using services like TrialPay. Liu said that Facebook wants to make this a platform that everyone can plug into, so it sounds like there will be many other ways to earn Credits. App2user Credits is slated to launch this June. Other future plans: Facebook will be seeding non-paying users with credits (to help get them in the habit of using them) and will also have a way to seed inactive users in the hopes of getting them to interact with apps again. There are also plans to offer bulk discounting on Credits, which will be paid for using some of the 30% fee that Facebook charges developers to use Credits. There will also be a feature for ‘auto top-up’, which can automatically refill a user’s account with 50 credits whenever they have fewer than five. When asked if Facebook will allow if alternative currencies like Social Gold will be able to exist alongside Facebook Credits, Liu dodged the question, saying that the platform was still in early days.